Positive results of the world's first gene therapy trial for a genetic cause of blindness known as choroideremia have been reported in Nature Medicine. The trial involved 14 patients receiving a single injection into the back of the eye of a virus containing the missing gene and began in 2011 at the Oxford Eye Hospital—part of the Oxford University Hospitals NHS Foundation Trust. By the end of the study there was a significant gain in vision across the group of patients as a whole. 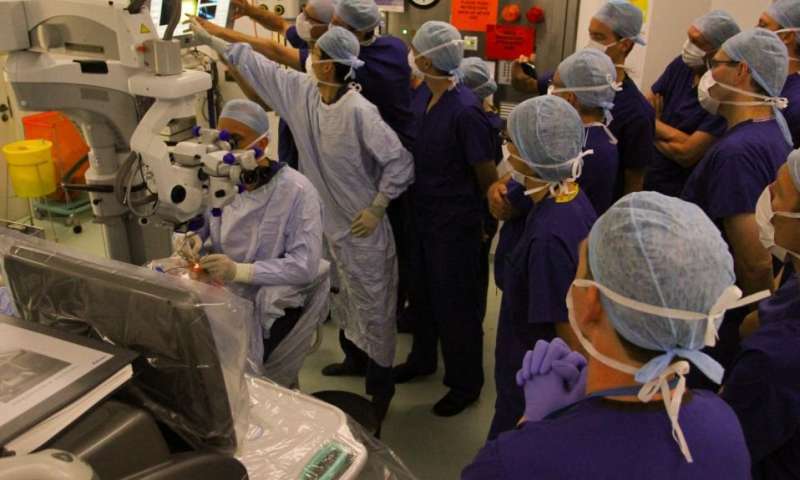 Professor Robert MacLaren the ophthalmologist who led the trial said: "The early results of vision improvement we saw have been sustained for as long as we have been following up these patients and in several the gene therapy injection was over 5 years ago. The trial has made a big difference to their lives." Choroideremia is one disease in a spectrum of inherited eye diseases sometimes referred to as 'retinitis pigmentosa' and which have now become the most common cause of untreatable blindness in young people. Last month, the European Medicines Agency formally approved its first gene therapy treatment for a different eye disease. Experts predict that other currently incurable diseases are likely to follow and will have approved gene therapy treatments in future years. Dr. Neil Ebenezer, Director of Research, Policy and Innovation at Fight for Sight, said: "All research breakthroughs are made by standing on the shoulders of others. Our mission is to fund research that will stop sight loss and we're delighted to have been part of this breakthrough which will have huge benefits for the future. This technique could transform how we treat diseases and could have broad applicability to a range of other conditions." Chris Hollowood, Chief Investment Officer at Syncona, commented: "Nature Medicine's publication of the findings of the first choroideremia gene therapy trial is a great endorsement of the work by Professor Robert Maclaren and the team and validation of the early results that encouraged Syncona to partner with Robert to found and build Nightstar. Since then, Nightstar has advanced the therapy to a pivotal Phase 3 trial. We look forward to continuing our support of Robert and Nightstar as we seek to bring transformational treatments to patients."